What you need: Small clay pots, several packets of flower seeds, Modge-Podge, paintbrush, potting soil, popsicle sticks, a Mother's Day poem*. What you do: Remove the seeds from packets and set aside. 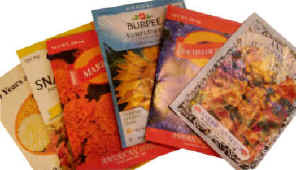 Make a note of planting directions before tearing the packets into 2"-3" strips. Use the paintbrush to apply Modge-Podge to pot. Apply strips to pot overlapping as you go. Finish by painting a layer of Modge-Podge over entire paper. Allow to dry. 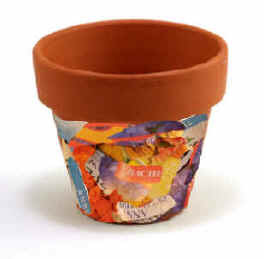 Fill pot with potting soil and plant seeds according to package directions. Staple a Mother's Day poem to popsicle stick. You may want to write the kinds of flowers that were planted on the back of the poem, and the child's name on the popsicle stick. Push the stick into the soil and give the beautiful pot to mom. *Find a Mother's Day poem by using the search link on our home page. Type "M.O.T.H.E.R." or "Mothers Day Poem" to find it, or encourage children to write their own poem or a personal note to mom.